Seagrass meadows are among the most important coastal/ marine ecosystems for long-term carbon storage and conditioning of coastal waters. A combined air-water flux of CO2 and CH4 from the seagrass meadows was studied for the first time from Asia’s largest brackish–water lagoon, Chilika, India. Ecosystem-based comparisons were carried out during two hydrologically different conditions of dry and wet seasons in the seagrass dominated southern sector (SS); macrophyte-dominated northern sector (NS); the largely un-vegetated central sector (CS) and the tidally active outer channel (OC) of the lagoon. The mean fluxes of CO2 from SS, NS, CS and OC were 9.8, 146.6, 48.4 and 33.0mM m-2d-1, and that of CH4 were 0.12, 0.11, 0.05 and 0.07mM m-2d-1, respectively. The net emissions (in terms of CO2 equivalents), considering the global warming potential of CO2 (GWP: 1) and CH4 (GWP: 28) from seagrass meadows were over 14 times lower compared to the macrophyte-dominated sector of the lagoon. Contrasting emissivity characteristics of CO2 and CH4 were observed between macrophytes and seagrass, with the former being a persistent source of CO2. It is inferred that although seagrass meadows act as a weak source of CH4, they could be effective sinks of CO2 if land-based pollution sources are minimized. • Distribution of Cu in different binding phases of sediments changes with changing pH of the surrounding environment. • Association of Cu organic matter increases at higher pH with sedimentary increases at higher pH. • Cu-SOM complexes may disaggregate and increase mobility at higher pH. • Increasing pH decreases lability of Cu complexes and increase mobility of Cu-complexes in sediments. • Concentration Cu in residual phases remains unchanged under varying pH. Impact of pH variation of overlying water column on transport and transformation of Cu-sediment complexes in the bottom mangrove sediments was investigated by using different metal extraction studies. The total Cu concentration in the studied sediments varied from ~64 ± 1 to 78 ± 2 mg·kg−1. The sequential extraction study showed that a major part of the sedimentary Cu (85–90% of the total sedimentary Cu) was present within the structure of the sediments with minimum mobility and bioavailability. The redistribution of non-residual Cu among the different binding phases of the sediments was observed at different pH. It was found that Cu shifted from the different non-residual binding phases to the organic binding phase of the sediments at higher pH. Partial leaching of sedimentary Cu-SOM complexes (with increasing stability as determined by kinetic extraction study) was observed at higher pH. This study infers that increase in pH of overlying water column may release Cu-SOM complexes and increase the mobility of Cu-complexes in mangrove systems. • The present study describes environmental variables and coral bleaching in the Lakshadweep Sea. • SST (Sea Surface Temperature) and pH were found to be responsible factors for coral bleaching. • Among the islands studied, Kavaratti and Agatti islands are found with higher levels of NO3 and NO2 due to more anthropogenic activities. • Narrow range of temperature in the Lakshadweep Sea for about ∼ 5 decades was noticed when compared with earlier reports. An observational investigation on the environmental variables in the coral reef ecosystem of the Lakshadweep Sea was made with reference to coral bleaching. The investigation was done during 2014–2015 in selected islands of Lakshadweep Sea. The environmental variables recorded were sea surface temperature (SST; 28.1–31.5 ° C), salinity (34.0–38.36 psu), pH (7.9–8.3), dissolved oxygen (DO; 3.19–7.70 mg/L), total organic carbon of water (WTOC; 1.6–3.20 ppm) and net primary productivity (NPP; 0.440–2.060 mgC/m3/hr). Nutrients of nitrite (NO2; 0.052–1.522μm ol/L), nitrate (NO3; 0.293–14.867μm ol/L), in-organic phosphate (IP; 0.287–2.070μm ol/L), total phosphorous (TP; 1.919–5.200μm ol/L) and reactive silicate (RS; 3.791–19.422μm ol/L) were also recorded. PCA showed positive loadings for salinity, DO, NO2, IP, TP, and RS in the Lakshadweep Sea. Currents and their divergence patterns influencing the upwelling in the nearshore islands might be the sources for the availability of nutrients. Data were treated statistically (linear regression) to understand the interrelationship between the variables. DO was found normal, indicating that the waters of the Lakshadweep Sea are well mixed and aerated. Nutrients such as NO2, NO3, IP and RS in Kavaratti and Agatti islands were found higher indicating that these islands are under the influence of anthropogenic activities. Cluster analysis revealed clear groupings among the islands. Agatti and Kalpetti islands were grouped together indicating more similarity in the values of environmental variables than with other islands. SST was found in the higher range over a study period and also over to the past ∼ 5 decades as per records and pH was found at the lower level in majority of the assessments. The unvaried ranges of SST and pH (P >0.01) might have favored bleaching of the corals in the Lakshadweep Sea. The nutrient levels recorded presently besides the other variables will serve as the baseline data for future investigations in the Lakshadweep Sea. The Perth Canyon is a prominent submarine valley system in the southeast Indian Ocean that incises the southwest Australian continental shelf. It is characterised by two main steep-sided valleys forming a V-shaped configuration that extend from a depth of ~600m to the abyssal plain at ~4000m. Despite its prominence and location of only ~27 nautical miles (50km) offshore, this study represents the first ROV-based exploration of the canyon and its inhabitants. ROV surveys revealed quiescent environments, the structure essentially representing a fossil canyon system with localised occurrences of significant mega- and macrobenthos in the depth range of ~680 to ~1800m. The patchy distribution of canyon life comprised corals, sponges, molluscs, echinoderms, crustaceans, brachiopods, and worms, as well as plankton and nekton (various fish species) especially near benthic communities. 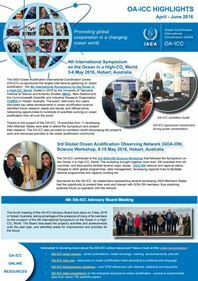 High definition video surveys and biomass sampling were complemented by ship-based multi-beam bathymetry, and seawater CTD profiling and chemical analyses. ROV transects were conducted at six geomorphologically distinct locations, from the head to the mouth of the canyon and on the northern shelf plateau. The dives traversed the generally featureless muddy canyon floor, along near vertical walls, and onto the canyon rim. ROV imaging revealed typically massive and well-bedded sedimentary units that are variably lithified and mostly friable. Biostratigraphic and palaeoecological analysis of foraminifers from rock and sediment samples (~700 to 1600m) indicate that they were deposited from the Late Paleocene to Early Oligocene within upper-middle bathyal (~200 to ~700m) water depths, thus implying that significant subsidence has occurred. Strontium isotope (87Sr/86Sr) dating also suggests the presence of Early Miocene sediments at the shallower sites. Settlement of large benthic sessile organisms is largely limited to indurated substrates mostly along the canyon walls. Corals were specifically targeted, with solitary (Desmophyllum dianthus, Caryophyllia sp., Vaughanella sp., and Polymyces sp.) and colonial (Solenosmilia variabilis) scleractinians found sporadically distributed along the walls and beneath overhangs in the deeper canyon valleys as well as along the canyon rims. Gorgonian, bamboo, and proteinaceous corals were also present with noticeable patches of live Corallium hosting a diverse community of organisms. Extensive coral graveyards were discovered between ~690–720m and 1560–1790m comprising colonial (S. variabilis) and solitary (D. dianthus) scleractinians, which had flourished during the last ice age between ~18ka to 33ka (BP). Faunal sampling (674m to 1815m) spans the intermediate and deep waters, which were identified as Antarctic Intermediate Water and Upper Circumpolar Deep Water, with temperatures of ~2.5 to ~6°C. The carbonate chemistry of those water depths show supersaturation (Ωcalc~1.3 to 2.2) with respect to calcite, but mild saturation to undersaturation (Ωarag~0.8 to 1.4) with respect to aragonite. Notably, some scleractinians inhabit depths below the aragonite saturation horizon (~1000m). Depth profile measurements of δ13C and nuclear bomb produced Δ14C show decreases within the upper canyon waters of up to ~0.8‰ (<800m) and 95‰ (<500m) respectively, relative to measurements taken nearby in 1978, thereby reflecting the ingress of anthropogenic carbon into upper intermediate waters. Thus, the canyon waters and its inhabitants are already being subject to the influences of CO2 induced climate change and ocean acidification. Many marine organisms are affected by ocean acidification, particularly those with shells and skeletons built from calcium carbonate; e.g., corals, oysters, clams, mussels, snails, and phytoplankton and zooplankton—the tiny plants and animals that form the base of the marine food web. These “marine calcifiers” face two potential problems associated with ocean acidification. The first one is that their shells and skeletons may dissolve as the ocean pH decreases; as CO2 is dissolved in seawater it becomes more corrosive, and the water chemistry undergoes major changes, such that fewer carbonate ions, the primary building blocks of marine organisms, are accessible for uptake to shells and skeletons. To build their shells or skeletons, marine organisms generally undergo an internal chemical process that converts bicarbonate to carbonate in the form of calcium carbonate. 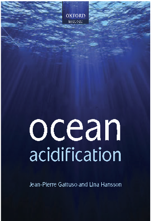 Exactly how ocean acidification slows calcification or shell formation is not yet completely understood, but various mechanisms are being studied. Most investigations of this corrosive environment focus on the evolutionary defense mechanisms that organisms must have in order to build and maintain their calcium carbonate shells and skeletons in an increasingly acidified environment. In such environments, these organisms can be subject to greater energy expenditure and environmental stressors such as ocean temperature increases, low oxygen accessibility, disease, and habitat loss. Ocean acidification is the ongoing decrease in the pH of the oceans, caused by their uptake of anthropogenic carbon dioxide from the atmosphere. Increased carbon dioxide (CO2) from the burning of fossil fuels and other human activities continues to affect our atmosphere, resulting in global warming and climate change. Less well known is that this carbon dioxide is altering the chemistry of the surface oceans and causing them to become more acidic. From scientists and marine resource managers to policy- and decision-makers, there is a growing concern that the process called ocean acidification could have significant consequences on marine organisms which may alter species composition, disrupt marine food webs and ecosystems and potentially damage fishing, tourism and other human activities connected to the seas. High-latitude coral reefs provide natural laboratories for investigating the mechanisms and limits of coral calcification. While the calcification processes of tropical corals have been studied intensively, little is known about how their temperate counterparts grow under much lower temperature and light conditions. Here, we report the results of a long-term (2-year) study of seasonal changes in calcification rates, photo-physiology and calcifying fluid (cf) chemistry (using boron isotope systematics and Raman spectroscopy) for the coral Turbinaria reniformis growing near its latitudinal limits (34.5° S) along the southern coast of Western Australia. In contrast with tropical corals, calcification rates were found to be threefold higher during winter (16 to 17° C) compared with summer (approx. 21° C), and negatively correlated with light, but lacking any correlation with temperature. These unexpected findings are attributed to a combination of higher chlorophyll a, and hence increased heterotrophy during winter compared with summer, together with the corals’ ability to seasonally modulate pHcf, with carbonate ion concentration [CO32-]cf being the main controller of calcification rates. Conversely, calcium ion concentration [Ca2+]cf declined with increasing calcification rates, resulting in aragonite saturation states Ωcf that were stable yet elevated fourfold above seawater values. Our results show that corals growing near their latitudinal limits exert strong physiological control over their cf in order to maintain year-round calcification rates that are insensitive to the unfavourable temperature regimes typical of high-latitude reefs.